This artist was an incredibly talented marine painter and landscape painter. Art critics call him a follower of Aivazovsky. 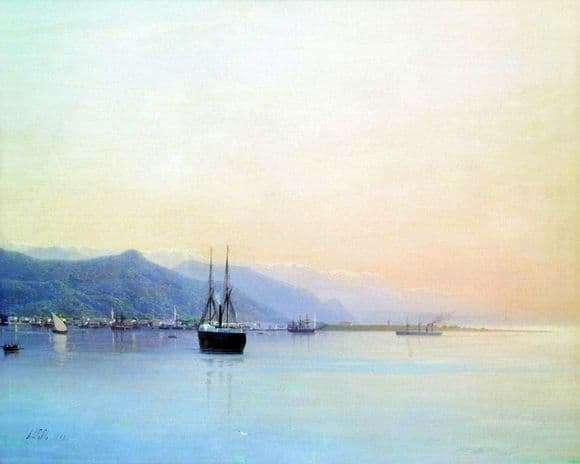 His love for the sea was limitless, and this forced Lagorio to take up a brush in his hands in order to portray the stunning seas of the Black Sea. He traveled a lot, and having extensive knowledge, became a professor of landscape painting. He was inspired by the surrounding nature, capturing it on his beautiful canvases, full of romanticism and depth. The most important topic for an artist is the sea, which captivated his heart and was reflected in the ingenious works of the creator. This picture shows the sea exactly the way Lagorio sees it. It is silvery, concealing hundreds of different shades and resembling soft velvet that spilled on the canvas. The harbor depicted in the picture seems incredibly quiet and peaceful. It evokes a feeling of space and freedom, which lurks a barely pinkish horizon. The mountains, covered with a gray haze, froze along with the water surface, which became the cradle for yachts and sailboats, frozen, as if during a calm. It perfectly conveys the color range, its colors are bright and saturated. The paintings of the creator have a special magnetism, capturing the eye and forcing with interest to observe each line, written with the brush of Lev Lagorio. His delight and admiration for seascapes, reviving on canvases and from which a fresh breeze breathes, is vividly felt. The breath of the waves is perfectly transmitted through various shades. The artist studied painting in the Louvre, which was reflected in his work, giving it a special subtlety and sensuality. In addition, he was an honorary member of the Academy of Arts. But unfortunately, the brilliant marinist died in poverty, leaving behind dozens of amazing canvases.